As the weather has warmed, stink bugs are coming out of hibernation and becoming a nuisance indoors once again. Every spring, stink bugs that have over-wintered in the warmth of your home are attempting to move outdoors. In route to the outdoors, many of them will pass through your living areas and cause a big “stink”. Spring is a great time to take action against stink bugs, because every bug caught this spring, that is one less stink bug that will potentially be laying hundreds of eggs this summer in your yard or garden. If you are seeing them repeatedly indoors, especially in certain rooms, we would recommend use of an indoor stink bug trap. A recent study by WPXI has the Original Indoor Stink Bug Trap from nth solutions coming out on top! What makes this trap unique and particularly beneficial for indoor use is 3 things: 1) This trap uses a light frequency that naturally appeals to bugs, 2) a lure is mixed with the water to attract stink bugs to the pool, and 3) the attractant concentrate quickly coats stink bugs that drop into the liquid, forcing them to die within minutes and preventing them from escaping. 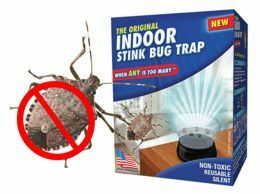 For a link to the recent WPXI pass/fail experiment performed on a number of stink bug products, please click here. We also stock a variety of stink bug sprays, which work well to treat vulnerable entries and exits for stink bugs around your windows, doors, walls, and baseboards. We also stock the Rescue stink bug trap, which is a great option for capturing stink bugs outdoors. Use this trap in the spring to capture stink bugs before they mate and lay eggs. Remember for every stink bug captured in the spring, you can prevent hundreds of new stink bugs this fall!